Frank J. Martone – Bloomfield Law Firm, Frank J. Martone, P.C. 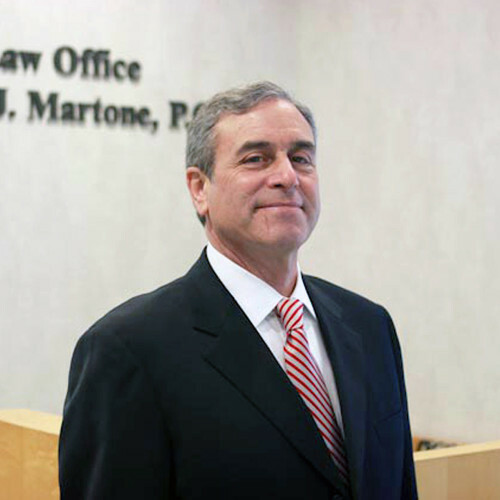 Mr. Martone is the Principal and Managing Attorney at Frank J. Martone, P.C. During his thirty-seven years of practice in New Jersey, Mr. Martone has concentrated his practice in the area of real estate law including settlements, title review, mortgage foreclosure, bankruptcy, evictions and Lender document preparation. He has also been involved in a wide variety of litigated matters, including alternate dispute resolution and has conducted numerous trials. Mr. Martone has lectured for Continuing Legal Education and private client seminars. He has appeared regularly at client sites to speak about real estate matters including mortgage foreclosure, landlord/tenant matters and real estate contracts. Mr. Martone has been a founding and managing partner of New Jersey lender-oriented firms for over 28 years. As the Managing Partner at this firm, he is readily available to clients and attorneys in the firm for consultation on any issue. Mr. Martone is a graduate of the University of Notre Dame where he received his Bachelor’s degree in 1972. He received his Juris Doctorate degree from John Marshall Law School located in Chicago, Illinois in 1976. Mr. Martone is licensed to practice law in the State of New Jersey and in the State of Illinois.